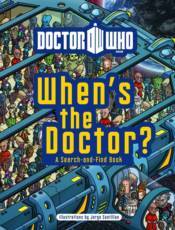 If you enjoyed tracking the Doctor through his alien adventures in Where's the Doctor?, you'll love hunting him and his friends down as he travels through time! Can you spot the Doctor, Rory, Amy and the TARDIS in Ancient Rome, Victorian London, or the far future? With loads to find, these incredibly detailed images will keep you searching for hours! This softcover edition includes five all-new 'timey-wimey' spreads not available in the hardcover edition! Allons-y, Whovians!